When you create your account, you are taken through the steps of creating your first website and a homepage template is created for you as a general guideline to help you get started. 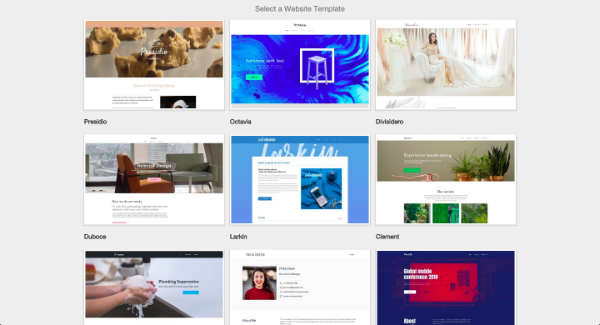 We include popular widgets that will help you create an exciting, vibrant site (such as the Gallery widget and Text widget), as well as some content that you might find useful. The homepage is the first page you should create for your website, and is also the page your site will open up to. Your homepage is like the "welcome mat" to the rest of your site. Keep in mind that your homepage should catch the attention of your visitors, and give them a good idea about the rest of the content on your site, and a clear way to navigate to this content. Beware of having too much information or general "clutter" on your homepage. The idea is to get your visitors to dig deeper into your site by navigating through the different pages you will be adding. Get started by creating your account. The Template Gallery offers you 10 beautiful responsive templates from which to choose. The name you enter here will be the title of your website. It should be clear and simple and, if not your business name, it should be a good description of your site. Don't worry - it isn't set in stone! You can change it whenever you want. Enter some contact information that will be added to your Contact page and click Finish Setup, or click No thanks, I'll do this later if you want to add in the contact information down the road. That's it! Your site is ready for you to edit, tweak and publish! You'll see that your site already has a template. There are a wide variety of templates to choose from. To change your template, click Style > Change Template and browse our full selection of Responsive, Premium, and Free designs. It's easy to change your template, so don't worry if you aren't sure which one to use. You'll also notice that your site only has one or two pages to get you started. You can start adding pages by clicking Page. Click on the yellow + and name your new page. Click OK and the page will be added to your site's menu. * Depending on what package you have, there may be a page-limit imposed. We have pre-populated your website with a layout and some widgets we think will suit the kind of site you want to build. Keep in mind these are suggestions to help you get started and can all be easily changed! You can begin populating your website by clicking into the widgets already on your page to add text or other content. In addition to this, the Widget menu is where you will find all the tools to add content to your site. Ranging from YouTube, to Picture Galleries, and Social Media widgets - there are plenty to choose from! If you do not like the page layout we have selected, you have the option of one of nine layouts. Click Page > Page Layout to view the options. 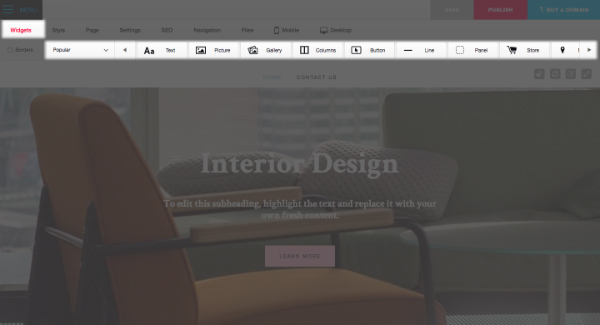 You can start with a blank page, or use a preset layout with drop zones to give you greater control over your content. Drag and drop a Text widget onto your page (Click Widgets and select Popular from the drop-down menu). Click inside the Text widget that you have just added to your page to start adding text. Just type in a few short paragraphs or, if you like, copy and paste some text you would like to add to your page. *However, please remember that some of the formatting may be lost upon pasting as the Text widget strips out incompatible coding. When you are editing your text, you will notice that a Text Editing Toolbar opens up at the top of your page. It looks very similar to the toolbar on other word processing software you might have used. Make some text bold, underline or italicize it. Type in a heading at the top of your text and change the font format to "Heading 2". Change the alignment of your text. Made a mistake? Just use the Undo left arrow icon on the Text Editing Toolbar to undo. Deleted something by accident? Use the right arrow icon to redo. Click on the palette on the right to access the Style Designer to format your text such as the font-family, color, size, and more! Center or left align it. Add a link to another website. Well done! 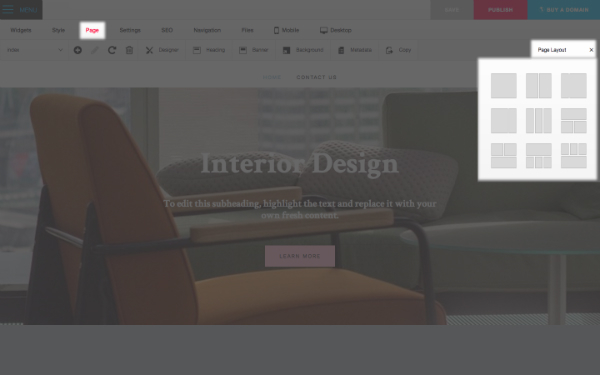 You are now an expert at text editing in your Sitebuilder! Remember these options when you add more text. Remember to save your page frequently to avoid losing your hard work. 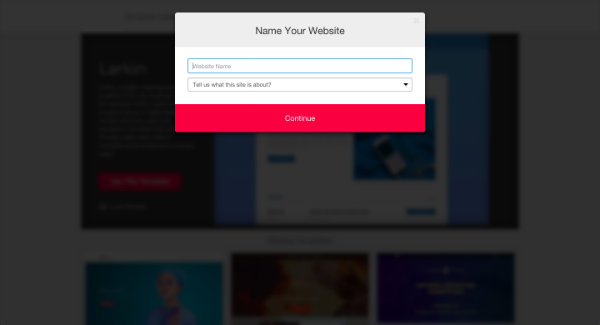 The Sitebuilder will prompt you to save if you navigate to a different page. However, you should save after every significant change. If you try to publish your site with unsaved changes, you will be prompted to save your site.